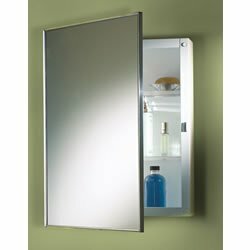 Basic 16.25'' x 22.25'' Surface Mount Medicine Cabinet by Jensen at Baharta. MPN: 614. Hurry! Limited time offer. Offer valid only while supplies last. 614 Features: Shape: -Rectangular. Mount Type: -Surface mount. Style: -Contemporary. Finish: -White. Shelves Included: -Yes. Door Included: -Yes. 614 Features: Shape: -Rectangular. Mount Type: -Surface mount. Style: -Contemporary. Finish: -White. Shelves Included: -Yes. Door Included: -Yes. Mirror Included: -Yes. Number of Shelves: -2. Door Type: -Swing door. -Includes mounting hardware. -Classic style. -Easy to clean. Dimensions: Overall Height - Top to Bottom: -22.125". Overall Width - Side to Side: -16.125". Overall Depth - Front to Back: -4.25". Overall Product Weight: -9.5 lbs.